Hematopoietic cell transplantation has become a cornerstone in the management of patients with lymphoma. The use of autologous transplant in Hodgkin’s and non-Hodgkin’s lymphoma has significantly improved the survivals of patients with relapsed disease. In patients with high risk disease, allogeneic transplant can improve both progression free and overall survivals by harnessing the graft-versus-tumor effect. Unfortunately, relapse is still a major problem post-transplant, and remains the most frequent reason for failure. In particular, patients who relapse after transplantation have received a significant number of lines of chemotherapy and have limited hematopoietic reserve. They may also have significant comorbidities, which limit their tolerance to traditional chemotherapeutic agents. Despite these obstacles, new strategies have been devised to treat these difficult populations of patients. Some options include maintenance regimens, immune manipulation, and novel agents. Maintenance therapies are low toxicity regimens designed to prevent relapse after completion of intensive chemotherapy. Previously, the benefit of maintenance regimens is minimal because of patient intolerance (interferon) or toxicity (chemotherapy). Novel agents, such as ibrutinib, and biologic agents, such as rituximab and brentuximab, are generally associated with lower toxicity and improved patient tolerance compared to traditional chemotherapy. This has allowed us to re-address the question of benefit of maintenance regimens. Encouraging results have been seen using these drugs in certain lymphoma subtypes. For patients who relapse after transplant, options for treatment were limited due to comorbidities and patient intolerance. The higher therapeutic index of novel and biologic agents have been used with success to improve survivals in this difficult to treat population. In those patients who have received an allogeneic transplant, cellular immunotherapy and vaccination therapies are additional strategies for long term control of relapsed lymphoma. It is an exciting time for patients with lymphoma. Since the development of rituximab and its approval in 2006, we have seen an explosion in the number of new agents for the treatment of lymphoma. In combination with transplantation, these novel agents hold the promise of improving the survival of patients with relapsed lymphoma. This issue of Blood and Marrow Transplantation Reviews provides a concise review of rapidly changing perspectives on prognostic considerations, pre- and post-transplant options to extend disease control, and transplant considerations. 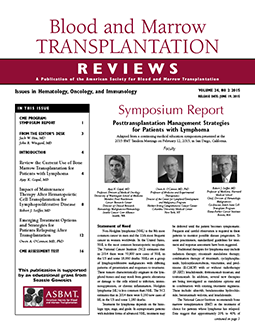 Dr. Gopal provides an insightful review of transplant options and outcomes. Dr. Soiffer next considers maintenance treatment options after transplant. Finally, Dr. O’Conner examines the shift in emphasis in treatment options for post-transplant relapse away from cytotoxic chemotherapy regimens to less toxic and more tolerable therapies.